The culprits are thousands of Cottonwood trees that line the shores of Lake Erie. 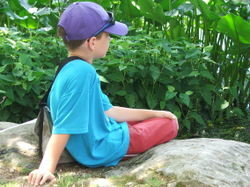 Ben finished his Plant Science Merit Badge requirements yesterday when we took a field trip to the botanical gardens. All of the outdoor gardens were closed but we spent quite some time in the two indoor exhibits in the glass house. The glass house is a four story greenhouse. The two separate exhibits contained plants from the spiny desert of Madagascar and the rainforest of Costa Rica. Interesting note: This tree can go without rainfall for an entire year, living on the reserve in its trunk. Tank bromeliads were growing everywhere. They grow on other plants and can hold up to two gallons of water. They support much animal life up in the canopy of the rain forest. This summer as well as last, Ben has worked a garden plot in the backyard. Last year, he impressed me by asking whether he could prepare the soil after it had been allowed to grow over for the previous five years. I was surprised when he turned over the entire plot himself, paid for seeds and seedlings and took care of the watering and weeding. 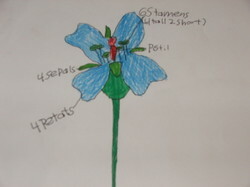 This year he has extended the size a bit and is working on some of the requirements for the Plant Science Merit Badge. In the spring, he planted green beans, spinach, carrots, cucumbers, lettuce, cherry tomatoes, Big Boy tomatoes, green bell peppers and Gypsy peppers. :) Here is his first harvest. We started doing nature study when Benjamin was a preschooler. He and I would come to the arboretum with Christopher in the baby sling or backpack. I began bringing along a sketchbook and camera after reading the books Wild Days by Karen Rackliffe and Keeping a Nature Journal by Clare Walker Leslie. I wanted to share a tip I use for those of you who are afraid to buy yourself a nature notebook and start sketching. I am not very adept at drawing three dimensional objects or creatures so I like to sketch things (copy them actually) from photographs or books. For example, if the children and I are out in the wilderness and we see a turtle crawling along, we try to identify it from our field guides. 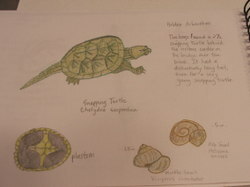 Rather than trying to sketch it there on the spot, I will come home and copy it from a book, again usually a field guide. 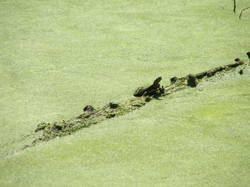 While we were out recently, we saw a small snapping turtle and several snails. I knew that I could not sketch the turtle accurately while it crawled along so when we got home, I took out the Minn of the Mississippi book and copied a snapping turtle drawing from its pages. Maybe some folks would think that was cheating but it is the only way I know how to draw. When we study nature, the kids and I each bring along a small field bag. Inside the bag is a small spiral bound sketchbook, a pencil and perhaps a small pair of field glasses. I carry the field guides in my own bag which is a big larger than the childrens'. 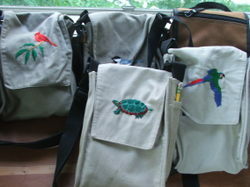 We have used these embroidered field bags for the past few years. They are made from a women's cooperative in Costa Rica. Really any old purse sized bag will do but we have gotten these as gifts and really enjoy them. 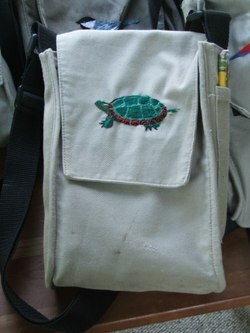 There is a pocket for a pencil on the side and ample room within for a field guide, sketch book and small pair of binoculars. I am very fond of the Golden Guide's St. Martin's Press field guides. They are relatively inexpensive, pocket sized, lightweight and fit nicely into the field bags. All of the pictures are illustrations rather than photos. For some reason, this appeals to me. 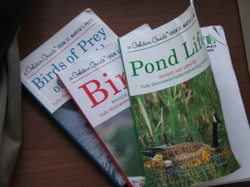 We use them all quite often but the Pond Life field guide is by far our favorite. 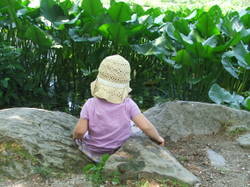 We spend a lot of time just sitting around the pond, observing and listening to the sounds. Sometimes the kids try to catch frogs, sometimes they gather pond water specimens to identify water bugs, nymphs, mudpuppies and tadpoles. Rarely do we go away from pond study without finding something interesting to learn about. 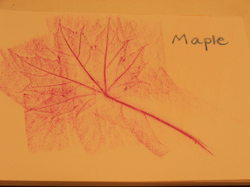 Now that all of the leaves are fully grown on our local trees, summer is a nice time to identify various leaves. We spread out a blanket and the kids bring back some leaves. Everyone lays them out and we take out our field guides to identify them. I usually bring along several peeled crayons with which they can do rubbings and to label their leaves in their nature notebooks. 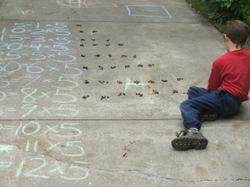 Even the youngest children in our family can do this exercise and really seem to enjoy themselves. We have been using the book Stikky Trees which uses picture words and brief bits of text on each page to help botany students (of all ages) identify 15 of the most common trees in one hour. We love this book. 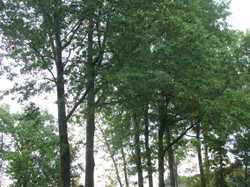 In addition to trees, there are so many other plants to study in the summer. 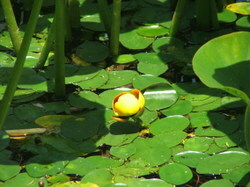 We love to identify the different types of water lilies at the pond as well as other aquatic plants like duckweed. I hope to read some of your suggestions and posts about how you enjoy nature study, how you interest your children to join in and how you go about keeping record of your journey/studies. The Aster Archipelago is the last stop on our journey using Shanleya's Quest. Asters are a composite flower with one flowerhead composed of many smaller flowers. The smaller flowers are composed of five fused petals surrounding the pistil and stamens. The petals surrounding the disc are called Ray Flowers as each are a complete flower in and of themselves. This family of plants contains over 19,000 different species. You can see the tiny individual flowers in the center disc, along with the Ray flowers protruding petal like from the outside. Each tiny flower produces its own seed. Some of the flowers in the Aster/Sunflower family include marigolds, dandelions, sunflowers, zinnia, chamomile, calendula and chrysanthemums. They are easy to spot because of their distinctive shape. 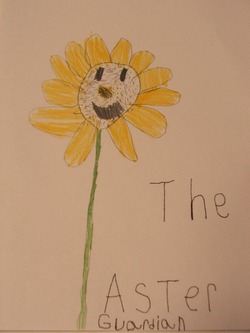 You can view photos and find out more about the Sunflower/Aster family here . Disclaimer: Do not ever eat a plant unless you are certain about its identity and edibility. Do not use plants that have been sprayed with pesticides, fertilizers or chemicals. Plant chamomile in your summer garden, even a pot will do! Pick dandelion greens for salad tonight. 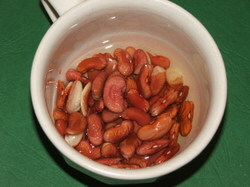 It is a great digestive aid and reduces indigestion. Choose small leaves as they are less bitter. Make calendula salve (here is a nice recipe though contains some new age-y jargon) and another simple recipe here. Our botany studies have followed Shanleya to the Island of Fruits and Roses. The Rose Family contains more than 3,000 species of plants. The blossoms of true roses have five sepals and five petals plus a number of stamen and pistils. Most of the fruits we eat belong to subfamilies of the Rose Family. Rose hips, strawberries, blackberries and raspberries are all fruits of the Rose Family. The Plum Family includes plums, peaches, nectarines, cherries and apricots. All of the fruits in the Plum Family have a seam down the side and a hard pit within. We have an ornamental plum tree in our front yard which provides food for all the fat squirrels in our neighborhood. 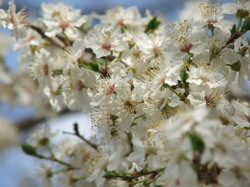 It happened to be bloom just in time for our study last week so the children were able to see the blossoms firsthand. 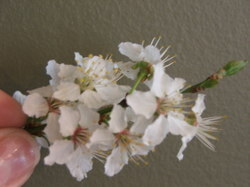 The fruit of the Plum Family forms on top of the flower. In the Apple Family, the fruit forms beneath the flowers. The five pointed star at the base of these fruits is formed by the sepals that used to be around the blossom. The Apple Family includes apples, pears and many berries. 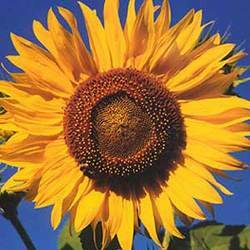 This site has some nice photos of fruits, blossoms and their foliage. I've added these books to my left hand sidebar if you'd like more information on any of the titles. Find some other great gardening and plant book suggestions here. Any activities involving dirt, seeds and water are a huge hit in my home. Sharon Lovejoy's books Sunflower Houses and Roots, Shoots, Buckets and Boots have some really creative and beautiful gardening ideas to share with your children. Whether you have a lot of acreage, a suburban yard or an urban terrace, there are gardening ideas for you in Lovejoy's books. I hope that you are able to get outside today, whether it is to rake some of last years' leaves out of your flower beds, to plant some window boxes or just to breathe the fresh air. Have a great day! This week we followed Shanleya to Grass Island where we learned about yet another group of monocots. Monocots have leaves with parallel veins as opposed to dicots whose leaves are net-veined. 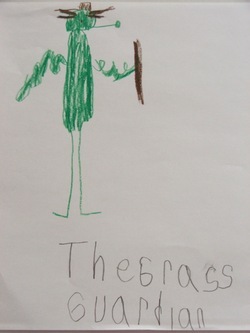 There are over ten thousand species of grass. 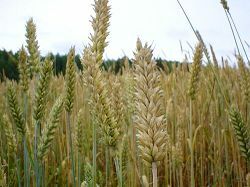 Plants in this family include most edible grains such as wheat, rye, millet, timothy, oats, corn, rice, sorghum and barley. Also included are bamboo, reeds and sugarcane as well as many plants for turf and fodder. 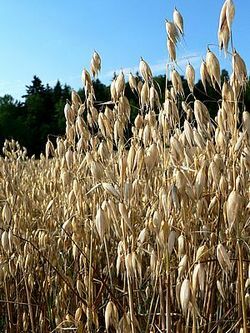 The edible part of the grass plant is the seed. Grasses are wind pollinated and do not need insects to assist in their pollination, therefore they do not have colorful flowers to attract insects. Grasses have three stamens and a pistil and are contained in modified leaves called bracts. 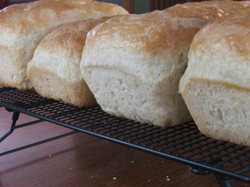 Bake bread using different types of flour. Which do you like best? Which is healthiest for you? 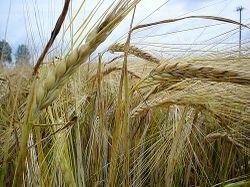 Which state in America produces the largest amount of each type of grain? Taste different forms of sugar (sucanat, brown sugar, powdered sugar, granulated sugar, raw sugar). Which do you like best? Which is the purest form of sugar? Where is sugarcane grown in the world? Where does bamboo grow? Purchase a tabletop bamboo plant and watch it grow. Learn the differences between different types of sod grasses. Which grass grows best in your region of the country? Visit a sod farm if you live in a warm area of the country. 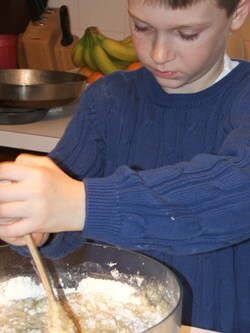 In keeping with the grains and grasses theme, our family had a baking day this week. 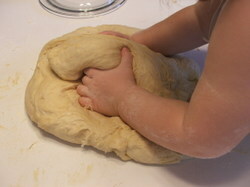 First, we searched the recipe archives of mothers who have many children. I figured that their recipes would certainly be tried and tested to perfection. I was right. 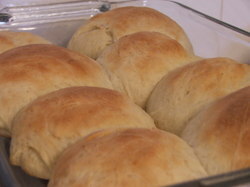 We made Danielle Bean's Banana Bread and Michelle Duggar's Homemade Rolls in addition to four loaves of sandwich bread. Both recipes produced such delicious results that I was forced to freeze the extras in fear that we would eat them all in the first 24 hours! I can't resist posting this one as well. Needless to say, our freezer is stocked and our tummies are full! Lynn writes: "Please may I ask how you integrated Apologia with Shanleya's Quest? Would you mind (if you have the time available) talking me through your average botany lesson?" We have used Apologia as a reference more than a first hand method of learning. Apologia Botany is written in a very Charlotte Mason-esque tone which is enjoyable to read. That being said, it is still a textbook which does not inspire them the way a living book does. That is why I have opted to use it more as a reference. 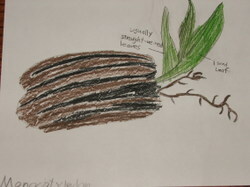 I have not required the kids to do all of the notebook activities or projects in Apologia Botany. Prior to starting Shanleya's Quest, we read and discussed the first chapter in Apologia. We also learned to identify the parts of seeds, trees, flowers, fruits, etc using the downloads from Montessori for Everyone. The downloads were a great way to jumpstart our botany lessons by learning some of the vocabulary. They were also a fun way to include the littles in our botany studies. After that initial reading, we have delved into Apologia as topics came up in Shanleya's Quest. For example, during Mint Week, we read about Stems from Lesson 8 in Apologia. Because the mint plants have a characteristically square stem, it seemed a good time to read this chapter. We discussed Lesson 2 (Seeds, Monocots and Dicots) when we reached the portion in Shanleya's Quest that discussed the differences between the monocots and dicots. We sprouted beans, dissected and identified their parts for Pea Week, reading from Apologia Chapter 2 (Seeds). 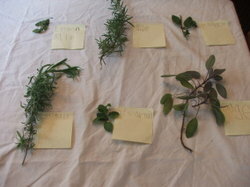 We discussed the different types of leaves (Lesson 6) when we learned about pinnate leaves during Mint Week. So, you can see we are not reading the chapters of Apologia in order. Now, on to the second part of your question. The average botany lesson in our home lasts most of an hour. We normally do botany twice a week, though we have taken off a number of weeks this school year due to illness and to the Christmas season. During the first lesson of the week, the children and I sit on the sofa and we read a chapter of Shanleya's Quest. We discuss the characteristics of that week's plant family. We read a bit from Apologia if it pertains to what we are learning. 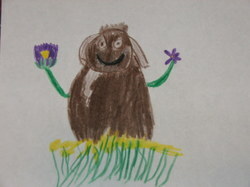 Often times the boys will opt to draw the Island Guardian that lesson as well. During the second lesson of the week, Benjamin draws the family characteristics for his notebook and we review the characteristics aloud. We print out the corresponding pages of information regarding the family characteristics from Thomas Elpel's website (found at the bottom of this page). They go in the botany notebook as well. 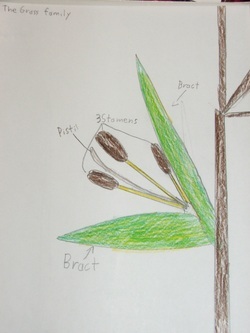 I mentioned that Ben is also doing the Plant Science merit badge for Boy Scouts. He worked on requirement five for a half an hour or so today, researching native and invasive plants on the internet. 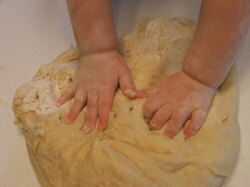 We also often use the second lesson to do any hands on learning or experiments that might be pertinent. I expect, as the weather warms, we will spend a lot of time out doors studying specimens, collecting plants, identifying plant families and the like. We will probably go back through Shanleya's Quest and refamiliarize ourselves with the identifying characteristics so we can put our learning to practical use outdoors. Tara writes: "I purchased Shanleya's Quest and assigned a chapter a week for my son. He just does not seem to enjoy it. He draws his obligatory page and that is all. What am I doing wrong?" I do not know if you are doing anything wrong. 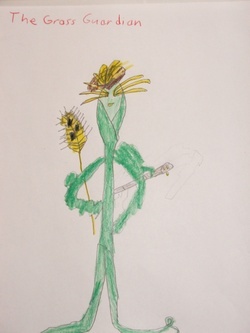 I am not sure how old your son is but my older son is the only one doing the detailed botany work. 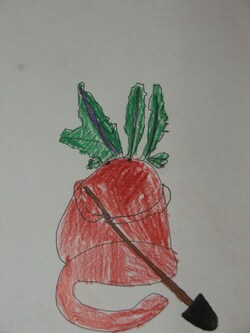 My second grade son merely listens to the chapter, illustrates the guardian and does any other fun, hands on learning. My eleven year old son is doing much more. Botany is something that we do together as a family. The children would probably not enjoy it as much if we did not read the chapters together, do the activities together and have a lot of fun to boot. I doubt that most kids would get excited about plants if left to their own devices. The children will pick up on your interest, or disinterest, and react accordingly. If you think Botany is fun and worth learning, more than likely they will too. If you live in a warm area of the country, perhaps you can sit outside and read the chapter together. Then spend a bit of time trying to find plants in your yard that fit the description of the plant family you are studying that week. If you live in a cold area, as we do, a trip to the grocery store to pick up flowers would be fun. During the second lesson, discuss and illustrate the identifying characteristics. Put them in a botany notebook. As my children begin to see their notebooks grow, they are motivated to continue to learn more and more. We have downloaded much of our work into the left hand sidebar photo album for you to see. This is a lot of information and I hope I haven't bored those of you who are not doing botany this year. Thanks for reading this far. :) Have a wonderful day! 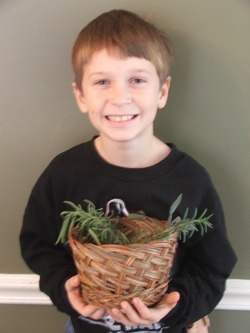 Ben is a Boy Scout and is currently working on the Plant Science merit badge. He thought it would be a good time to earn it since we are studying botany at home this school year. Here are the requirements for the Plant Science Merit Badge. 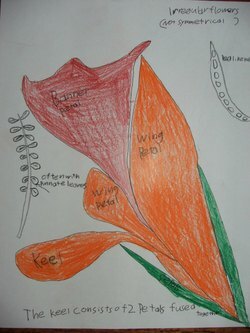 If you have an older child (perhaps fifth grade through high school) and want to flesh out your botany studies, I think you will find these guidelines to be excellent. The requirements are very thorough and would nicely complement the Botany in a Day and Shanleya's Quest books. There is a corresponding worksheet that can be used to record the child's work. As a side note, I would encourage anyone who finds the Boy Scout requirements interesting to look into Scouting for your sons. The program is top notch. We have been so blessed by the wonderful families and boys that we have met through our years in Scouting. Here are the other merit badges that can be earned. I think we could base our homeschooling lessons on merit badges requirements alone and give the children an excellent education. We have been following Shanleya on her adventure and she has brought us to the island of the Lily Family. 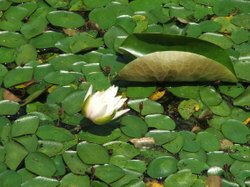 The Lily Family follows patterns of three and six that help us to easily identify the family from other plants. 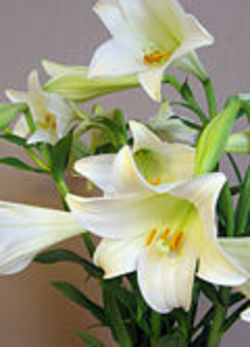 Lilies are monocots, which means when they begin to sprout, they have only one seed leaf. Monocots also have parallel leaf veins as opposed to the net veined leaves of dicots. The Lily Family flowers have three sepals and three petals, all of the same color. 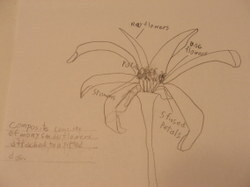 It is important to identify flowers from the outside in: first the sepals, then the petals, stamens and pistil. 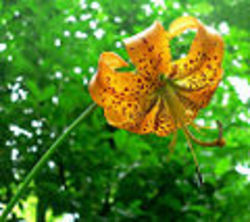 Normally, sepals are green but in the case of the Lily Family, they are the same color as the petals. 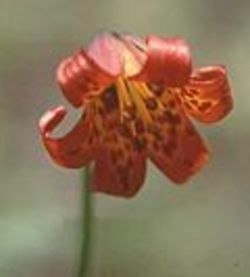 The Lily Family has six stamens and one pistil with a 3 parted (or Y shaped stigma). Most plants in the Lily Family grow from bulbs. Read more about the Lily Family here. Also on that site, you can see photos of flowers of the Lily Family and its subfamilies. Most Lily Family members are edible though a couple are poisonous so it is very important to be able to positively identify them before eating. Starting lily bulbs indoors to be transplanted outside when the fear of frost has passed. 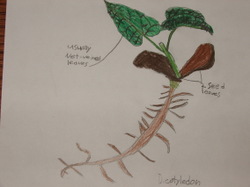 We recently learned the differences between monocotyledons and dicotyledons. 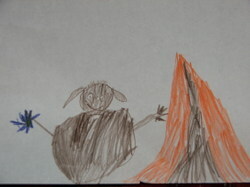 Ben illustrated the following drawings and labeled their major identifying characteristics. Dicots usually have net veined leaves and two seed leaves when beginning to sprout. For the purpose of Shanleya's Quest, the dicot families are Mustard, Mint, Parsley , Pea, Rose and Aster. 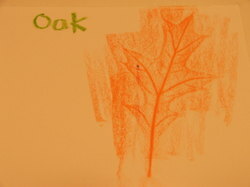 I realized after taking this photo that Ben sketched and colored the seed leaves brown rather than green. He later corrected it but I did not take a more recent photo of his drawing. The seed leaves should be green as they are the first green to sprout from the (bean in this case) seed itself. Monocots have one seed leaf. They usually have straight parallel veined leaves. The Lily and the Grass family are examples of monocots. The Pea Family is characterized by its irregularly shaped flower containing five petals: a banner, two wings and a keel (which is comprised of two petals that look like one). 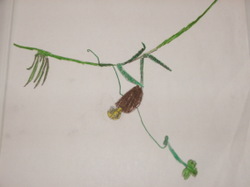 The Pea Family also produces pea-like pods that open along two seams and often have pinnate (opposite) leaves. Some members of the Pea Family include clover, lupine, most beans and legumes, wild licorice and alfalfa. There are 13,000 species belonging to the eight tribes of the Pea Family. 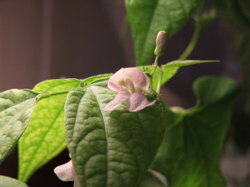 Here is a photo of a kidney bean blossom that we sprouted way back here. Notice the banner, wings and keel. 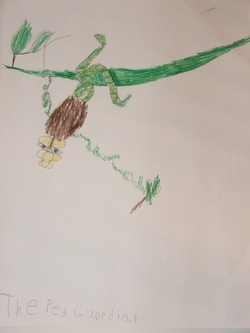 Here are the boys' drawings of the Pea Guardian from Shanleya's Quest. Sprout any bean you have lying around the house. Record its growth in your botany notebook each day. 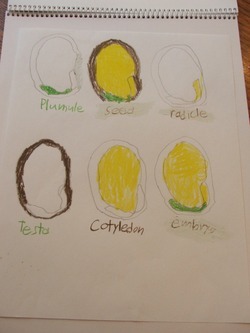 Draw and label the parts of a seed. Determine whether beans (and the entire pea family) are monocots or dicots. Make Black Bean Chili for dinner or another meal made from peas or beans. We began our study of the Mustard Family before we took our Advent break. 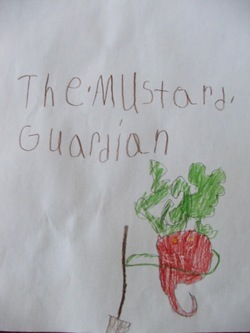 Today the kids finished their illustrations of the family characteristics as well as the Mustard Guardian from Shanleya's Quest. The Mustard Family contains radishes, turnips, cabbage, cauliflower, kohlrabi, Brussels sprouts, broccoli and kale (as well as 3200 other species). Some dinner ideas include Broccolini, Brussels Sprouts with Garlic and Bacon, or Potato Kale Soup. Commercial mustard is made from the seeds of the black mustard plant combined with vinegar. We sampled several types of mustard this week. My boys were hesitant but eventually tasted the different varieties. I mentioned to them that the initial sourness that they would taste was, in fact, the vinegar. After that taste wore off, the true smoky mustard flavor would remain. You can also make your own mustard for fun. The Mustard Family is identified by its four green sepals, four petals, six stamen (four tall and two short) and one center pistil. 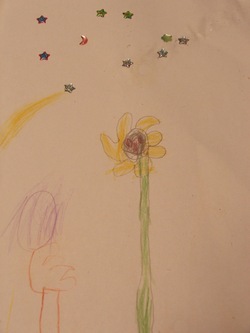 The children learned that the male flower part can be remembered because they "stay men". 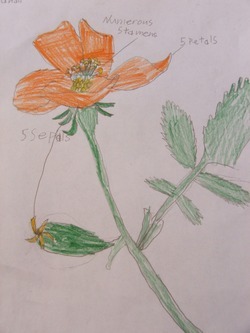 They also learned that when identifying a plant, one should work from the outside in...first the sepals, then petals and lastly the stamen and pistil. When browsing Thomas Elpel's website Wildflowers and Weeds, I stumbled upon this card game that is based on Shanleya's Quest. Here are some game ideas using the cards. It looks like a great way to reinforce the different plant families and have some fun to boot. We have been learning about the Parsley family this week. This family of plants is the most important to learn because the two deadliest plants in America belong in its ranks. The Poison Hemlock and the Water Hemlock are deadly if eaten. Water Hemlock has a hollow stalk, as do many of the parsley family members. Children have died simply by using its stalk as a straw. Also, people often mistake the poisonous members of the parsley family for wild carrots and die after eating them. The Parsley family is identified by its often hollow stalk, flower with five petals, five stamen and compound umbels on stems radiating from a single point at the end of the stalk. 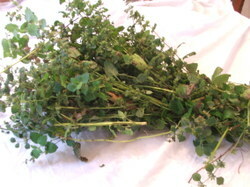 Today we harvested the rest of the lemon balm that was growing in the herb garden. Because we are studying the mint family this week, it was the perfect tie in as lemon balm belongs to that family. You can see that it is a pretty sorry bunch since it had already gone to seed but the leaves can still be frozen and used for tea this winter. We picked it all over, which took most of an hour to do. Ben then read from A Kid's Herb Book how to make lemon balm tea. Lemon balm is known for its fever reducing properties as well as being helpful for colds, flu, coughs, nervousness, whining or crying, wounds and sores. A Kid's Herb Book covers sixteen different herbs and their uses. It also includes fairy tale stories, recipes, songs and poems. I love this book and would recommend it for anyone, young or old, who is interested in learning more about plants and herbs in daily life. There are recipes for garlic ear oil, tips on how to lessen the pain of a bee sting, making flower vinegar, making homemade marshmallows and much more. Today we used the information on making herbal teas using two different methods, infusion and decoction. Infusion is the way most teas are made, by pouring boiling water over the top of the herbs and steeping them. The decoction method involves bringing the herbs themselves to a boil and simmering for thirty minutes. Ben experimented with both methods and we sampled both. 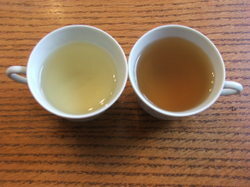 The infused tea (on the left) was lighter and had a pleasant lemony taste. The tea made using the decoction method was stronger tasting. If using lemon balm tea for fever reducing, I would use decoction but for general drinking enjoyment, Ben and I agreed upon the lighter tea. Mary Kathryn harvested the remaining sage from the garden, pulled the leaves from the stems and it is now drying nicely in a basket. I will add it to our stash in a few days. I explained here some about Thomas Elpel's book Botany in a Day. 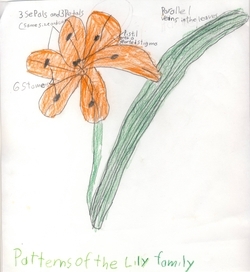 This book is a wonderful resource to have if you are studying Botany with your family. This morning, we began our quest to learn the seven most common families of plants that Elpel claims will enable us to know over 45, 000 different species. We are using the sister book to Botany in a Day which is called Shanleya's Quest. This book is a child's version of Botany in a Day, introducing the seven plant families by way of a fairy tale. The main character Shanleya travels in a canoe from island to island in the sea. Each island is inhabited by one plant family and a "guardian". Some of the guardians are good and some bad. (The bad guardians inhabit islands on which poisonous plants grow, thus teaching the kids which plant families contain poisonous species.) 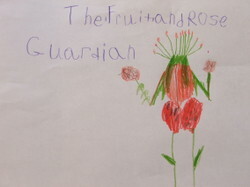 Each guardian is illustrated in a way that enables the child to remember the characteristics of the plant family that is inhabiting the island. 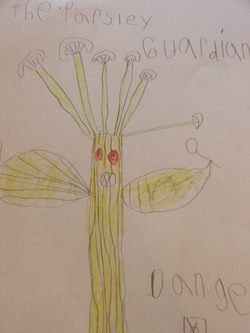 Today we met the Mint guardian who has a square stalk, opposing leaves and is aromatic. The illustration is quite cute. 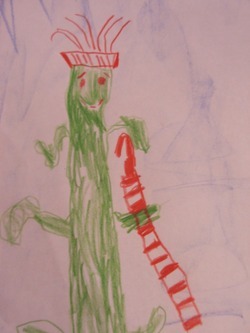 The guardian has a peppermint stick for a walking cane, wears a hat of bee balm flower and has limbs that are square. 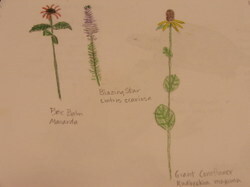 Learning this plant family will help us to identify 3,500 American plant species. 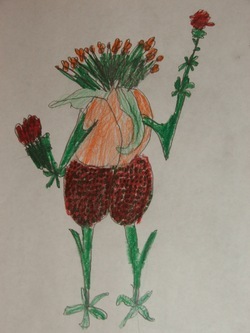 Here is Benjamin's drawing based the characteristics of the mint family. We ventured outside and collected specimens from around the yard that fit the Mint Family description. While fall has definitely arrived in our area of the country, we still have some plants thriving under the cover of autumn leaves. All of the plants went to seed weeks ago but they are still able to be identified easily. Here is Ben's collection. 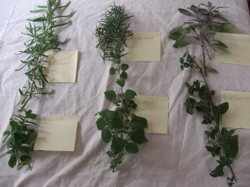 All these have now been pressed and will be included in the children's botany notebooks. Here is Christopher after collecting his samples. He had lots of fun and is really enjoying Shanleya's Quest. I also included this printout in the children's botany notebooks. *One small note about both of Elpel's books. 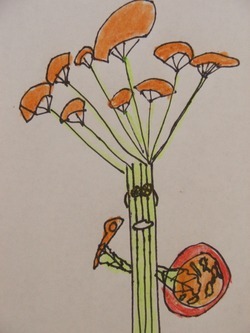 He has theories about how all plants evolved over the course of millions of years. I mention this because I know that some families are open to reading books that contain evolutionary ideas and verbage and others are not. Botany in a Day has one chapter devoted to this topic but the remaining parts of the book are plant identification and characteristics. Shanleya's Quest is written in fairy tale form but includes perspective on how the earth was formed from an evolutionist's viewpoint (anthromorphizing the sun and moon as talking co-creators). The creation of the world is presented in fable form but I wanted you to be aware of it nonetheless. Our family has thoroughly enjoyed both books and has found them to be an invaluable resource for our Botany adventure. 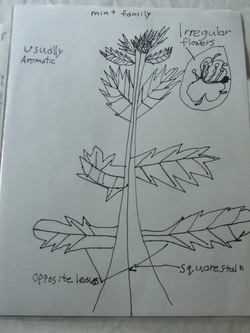 I decided early this summer that Ben would study botany for science this school year. I had intended to have Christopher doing something different but I gave up that idea and went with the same science and history for both boys. It has saved a lot of time and frustration. I am simply requiring more of Ben than I do of Christopher, based on their ages. I ended up buying a few books that I could use throughout the year for various parts of the botany study. They are all listed in my left hand sidebar. Apologia's Exploring Creation with Botany is a nice overview text, written directly to the child. We are using it as a spine and are going through the chapters slowly. There is a lot of information in each chapter but we are reading them bit by bit to make them more digestible. When we begin to study plant families more deeply and specifically, Botany in a Day will be used extensively. It is a wonderful resource. Written at an adult reading level, I think most high school students would be able to use it independently. It also can be simplified for teaching younger children the identifying characteristics of each plant family. The author keeps a website of more than five hundred flower photographs here. He also offers the following free online pages that come directly from the Botany in a Day book. You'll see that Elpel uses clearly drawn black line illustrations to show the various differences between the family of plants. He breaks them down into the seven most common families: mustard, mint, parsley, pea, lily, mallow and aster. According to the author, by learning these seven families and their characteristics, a person can positively identify over 45,000 plants. 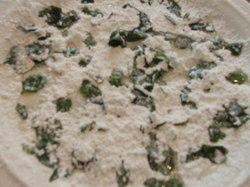 I will be teaching the main family differences to the younger children such as the mints having square stems. Ben and I will explore further some of the more detailed characteristics. 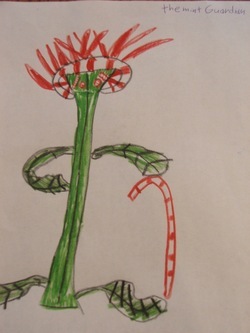 The younger kids have been using the Botany downloads from Montessori for Everyone. I have ordered many downloads from Montessori for Everyone in the past. 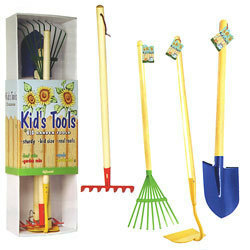 They are an easy and affordable way to add some hands on learning to your homeschool. Chris and Mary like to color and label the cards while Ben has drawn and traced a number of them to coincide with what he is doing in the Apologia book. I will upload any work they do to the botany sidebar throughout the school year. Today, we soaked and dissected bean seeds to identify the cotyledons, radicle, testa, highlum, embryo and plumule. We learned that beans were found in King Tut's tomb. 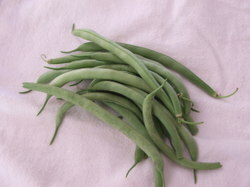 They were planted and grew into healthy bean plants though the seeds were thousands of years old. I am always amazed at what I learn as a homeschooling mother/teacher. I have never studied botany as either a child or as an adult but I am enjoying it immensely. It is fun to teach your child something new but it is even more fun to discover something new together. 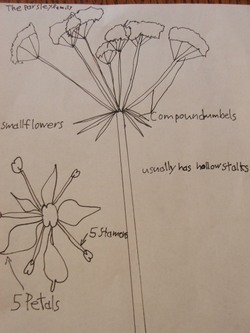 Here is Ben's page of the parts of a seed.